This is another film by Ken Loach in which the jolly capers of crime have replaced the political debates of his earlier films. In Looking for Eric Eric Cantona and friends get revenge on Mancunian gangsters, here the thuggish Robbie finds a purpose in his skilled taste for whiskey but he’s still a criminal as he gets one up on the world. This is like a jokey Cooke’s Tour of working class Scotland. Loach, like Mike Leigh, has a lifelong interest in the quaint anthropology of the working now under-class and its brutal life. Here the working class gets the less noble savage treatment (as opposed to the political films), presumably he’s given up on attempts at socialist politics. Apparently, Robbie and his friends are not professional actors, so they display the usual wooden self-consciousness of the non- professional. This is supposed to make things more authentic, after all aren’t the underclass uneducated and inarticulate? They use their wits to get the hugely expensive whiskey and make money from it, but it looks just like another attempt at caper hilarity. There is no redemption for Robbie through inner struggle, just him and his friends getting the better of other people. In Harry Loach recycles the kindly mentor role of Colin Welland in Kes and he looks like Brian Glover (the sports teacher from that film). There is the same superior fascination with the antics of working people with a hobby, in Kes it’s the training of a kestrel and in Angels’ Share it’s whiskey. Robbie and co have learned nothing except to steal from the rich (a barrel of whiskey worth a million pounds), yet we’re supposed to find this pseudo-Robin Hood stuff quite endearing. Loach has stopped making thoughtful films and now looks as if he is theme-parking the sad remnants of the industrial working class for global consumption. The Angels’ Share of the title refers to the 2% of whiskey that evaporates in the cask throughout the year, and it looks as if we don’t get much more in the way of a sympathetic film. An unlikeable and exploitative film. Tags: 2012, comedy, dir Ken Loach, Gary Maitland, Glasgow, Jasmin Riggins, John Henshaw, Paul Brannigan, Roger Hallam, screen writer Paul Laverty, Siobhan Reilly, whiskey heist, William Ruane, winner of the Cannes 2012 Jury Prize, working class offenders. Ridley Scott’s prequel to Alien, though it has been denied that it is. Scientists Noomi Rapace (Elizabeth Shaw) and Logan Marshall Green (Holloway) discover cave paintings showing giants pointing to the stars. Then in 2093 a spaceship travels to outer space. On board is an android (Michael Fassbender playing David) who wakes the crew up, and they explore the moon they’re on, which orbits a ringed planet. Charlize Theron plays Meredith Vickers, head of the Weylon Corporation. The scientists want answers to our origins, Vickers has other priorities. The crew explore a giant installation and they find alien eggs and they are attacked by these aliens. They find a giant humanoid, a survivor of the spaceship. Will the humanoid attack the crew and what will the aliens do…..? In spite of protestations to the contrary, this is the prequel to Alien. Ironically, of course, the earlier events in this 2012 film enjoy the benefit of advanced cinematic technology unavailable to the later events of the 1979 film. There is little hint here of how the world of the Alien film could be tacky and picaresque, the antiseptic hi-tech of Prometheus would preclude this. Prometheus is closer in appearance to the blander, more amenably hi-tech, world of 2001. Prometheus is pre-occupied with life and death, the nature of mortality, and our own origins. Elizabeth Shaw is committed to our being created by a high intelligence, so she is no Darwinist. If you think about this, then a lot of sci-fi must be inimical to Darwin because it insists on the creation of artificial and natural life, even in 2001 there was the intervention of a black monolith to get us going. Elizabeth Shaw wants to know why the giants turned against humans. Ridley Scott also explores the boundary of human and non human intelligence in the relationship between the android David and the scientists. Scott explored this in Blade Runner (1982) when the androids poignantly aspire to human status. David likes to watch Lawrence of Arabia, no doubt identifying with Lawrence’s indifference to ordinary behaviour. David seems essentially benign, which makes Ridley’s later fear of androids less excusable. The dialogue between the crew members is mostly professional, political, and not disinterested. The Weylon Corporation behaves in a sinisterly secretive fashion. The scientists do not work as a team, more like business rivals. 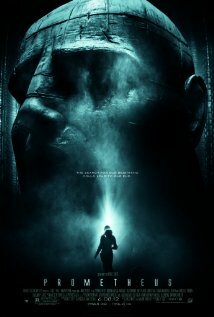 Prometheus takes us back to the hollow installation with its Giger style that we first saw in Alien. The look is all metallic insect exo-skeleton. It is a sort of organic geometry which reminds me of Gaudi’s Barcelona architecture. The humanoid giants look like Michelin men from the car tyre commercial and their eyes make them look like they’re wearing giant sapphires as contact lenses The aliens have of course become familiar, and in Prometheus the parameters of their appearance have only extended a little. Now they look like tattooed multi-eyed octopi. Their modus operandi are insect like and parasitic. Prometheus elaborates on the Alien scenario rather than explaining it, presumably to leave scope for a sequel, which looks likely given the ending.